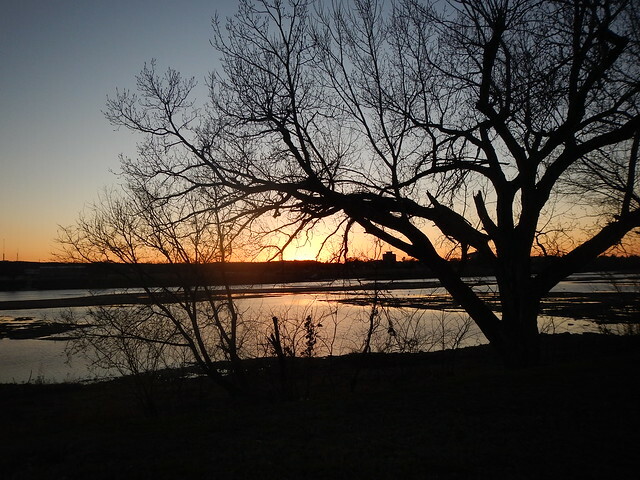 Those who follow me know that one of my joys is my weekly run after work on the Tulsa River Parks Trails along the Arkansas River. I run the trails almost regardless of the weather. Lightning and Ice are the only reasons I have not run the trails. 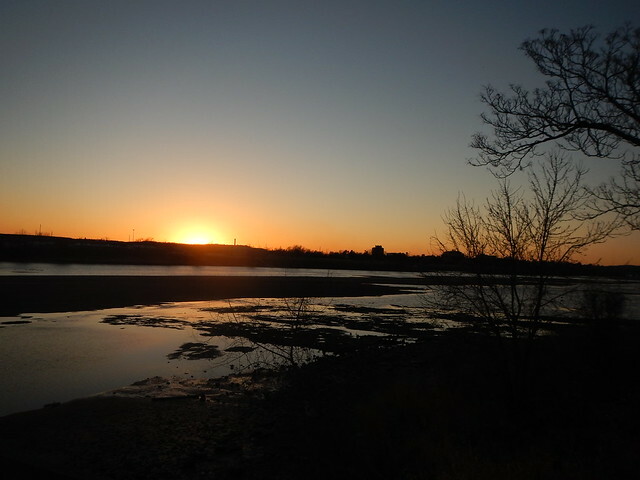 And this time of year by the time I get changed and dressed and then out to the river the sun is about to set. It was about five degrees cooler than I was planning on and there was a fairly stiff northern breeze that I hadn’t planned on either. I was a little under dressed with just shorts and a long sleeve t shirt but I put in three miles anyway. I started out into the wind so that when I turned around I was with the wind. Otherwise, even with the best technical gear you turn into a refrigerator. So coming south on the west bank was great, I was very comfortable and was able to enjoy the run. If I had been dressed just a tad warmer I might have gone another mile or two. Sorry for the fuzzy shot, on the west bank looking back across the river. 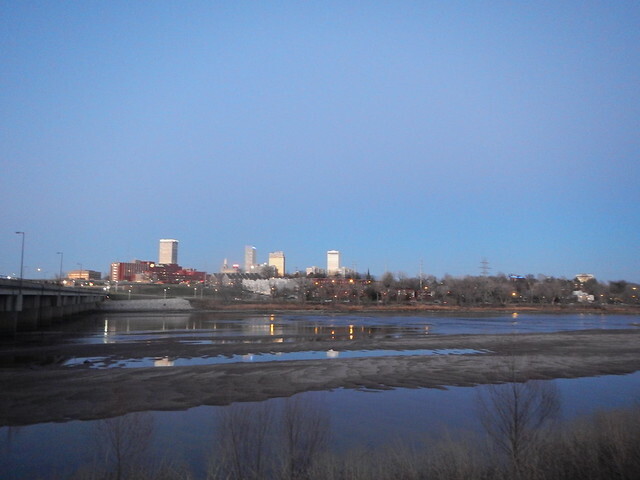 Downtown Tulsa is a couple miles past the river. I injured myself a couple months ago and and been going through a self rehab of run walks, and massage and just trying to be patient and it worked out. Last Sunday I ran in a Quarter Marathon with some pretty good uphills and downhills and finished without any problems so this week on my weekly run I let myself run a lot more than usual. The thing about running is that running, even running as slow as I do, is a lot more fun than walking. The thing about by new gym at the Methodist church downtown is that I can go change there and then drive down to the river and run my run and then drive back to the gym and shower and get clean clothes on rather than showing up at home all stinky, smelly, and hungry. As you can tell, I am rather spoiled. I highly recommend being spoiled. 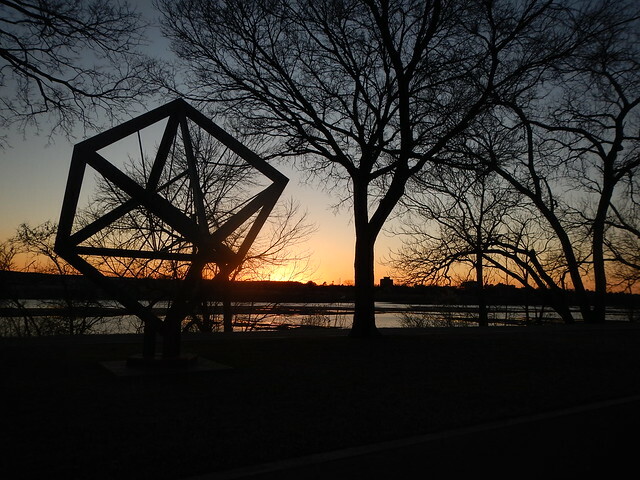 This entry was posted in Skywatch Friday and tagged Arkansas River, Running, Silhouettes, Skywatch Friday, Training on March 1, 2017 by Alan Bates.